NEXT Silver gains "subroutine End the run." for each rezzed piece of NEXT ice. The networking capabilities of the NEXT suite of ice are unparalleled. In most cases, you don't want to use Silver without a little help from his NEXT Bronze friend. Those ICE works in team, and your objective as a corp is to have as many of them rezzed as you can. They are cheap, and grow with power during the course of the match. On its own, Silver is just a lonely Ice Wall which can't be advance. You need to build deck around it. Most likely, you will want to play The Foundry: Refining the Process, which lets you add another copy of ICE when you rez it, great to build server defenses fast. Since you need to pay 12 influence points for the whole suit, you probably won't see it outside of HB faction. With three Silver and three Bronze rezzed you can pump it up to 6 "End the runs", and with Mother Goddess you will turn it to SEVEN. I can't wait what other NEXT ICE future will bring. But there are cons obviously. Alone, those ICE are not very powerful, and if runner doesn't poke every server, you won't have many occasions to rez you defences. So it's best to group you NEXT, so the first rezzed make the second one stronger. 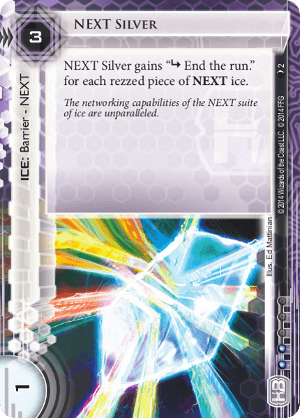 Sometimes, you will want to lure runner into your servers just to activate your NEXT ICE, so they will be more taxing next time. You may think about playing Amazon Industrial Zone, so you rezz them on one server basicaly only for install cost. Rezzed NEXT is stronger than unrezzed. The greatest danger is of course ICE destruction. Parasite will ruin your day, and new cutlery events, Spooned and Knifed will make you cry. So beware - with each NEXT destroyed, your chain weakens.